The big question on a lot of human resource and compensation managers’ minds is that will appeal to candidates and help to retain more employees? In other words, what is it that makes employees look for companies that offer certain benefits? If a company wants to become an employer of choice, outside of starting salaries and industry reputation, studies have shown that great benefits are the key ingredient to success. The question comes down to understanding the unique needs and goals of the people who typically make up your workforce. Whether they are Millennials just needing the basic health insurance coverage, or Generation X folks who are raising families, or Baby Boomers who are getting ready for retirement – the benefits you choose will have an impact on their lifestyles. The Affordable Care Act mandates certain health care benefit coverages, so the easiest way to handle this task is to start here and build up. Choose the health care benefits that fit under minimum requirements, such as preventative medical care for all eligible employees and vision care for children. Then explore at least two other health care plans that offer the next level of health and wellness coverage. In today’s multi-generational workforce, there are no health care plans that can be one-size-fits-all. Instead, there must be a variety of benefits offered so that employees can choose the plans that fit their unique lifestyles. Work with an insurance broker to provide you with a number of low cost, voluntary benefit options. Consider benefits like cancer care, hospital cash plans, pet insurance, additional life insurance, and disability insurance. What appeals to many employees is a strong retirement plan coupled with financial management tools to help them get more from earnings. Therefore, your competitive benefit plan needs a retirement savings with generous matching company dollars. Then provide a flexible savings account or health savings account to help employees stretch their pre-tax dollars for items that insurance may not cover. Give employees more purchasing power through corporate discount programs and via stock incentives. Add another valuable layer to your company benefits plan by investing in their skills and knowledge in the industry. Set up a company learning center and offer regular training and development classes taught by local universities or industry experts. Pay for a portion of the tuition fees for employees returning to college or taking part in certification programs. Focus your financial benefits on incentives for employees who complete their goals, offering a generous raise for attaining higher levels in the industry. What many employees are looking for is the chance to work for an outstanding employer who understands the importance of having a life outside of the office. A may include access to onsite lifestyle services (dry cleaning, fitness, cafeteria), as well as flexible scheduling that allows parents and caretakers the ability to manage demands on their time. Remote work is also a nice perk, and having the ability to bring pets and kids to work when needed is nice too. At the very least, have a generous paid time off benefit available to all employees. 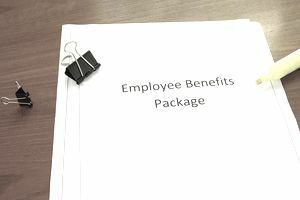 By following the above guidelines, your company benefits will become highly competitive and appeal to a large number of employees, making your life easier.